Aromatherapy, sometimes also referred to as aromatic or scent medicine, is the art of healing the body using naturally distilled essences from different parts of plant to improve and enhance your everyday emotional, physical, and spiritual well-being. These essences are known as essential oils. 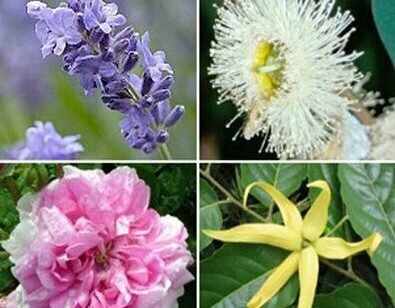 These oils are the concentrated essences of the aromatic plant. They can be used as an analgesic (to alleviate pain), an anti-inflammatory (to reduce swelling), an anti-bacterial, an anti-fungal, an anti-viral (to prevent infections). Since scent stimulates the part of the brain that effects your emotions, essential oils can also sooth and calm….or energize and arouse. These essential oils are highly concentrated and are measured in drops. They should be housed in dark colored air tight bottles in a cool area, out of direct light. Unless noted, they should not be applied directly to the skin, but instead placed in a Carrier Oil such as Almond oil, so as to avoid irritation. Our sense of smell is about 10,000 times stronger than our sense of taste, but it is truly under-appreciated. The olfactory system of your brain has a memory of scents and the longest recall of all the senses. Just think… does the smell of baking bread bring back vivid memories of visits with a relative in your childhood.. ever catch a whiff of the cologne/perfume of an old lover? Memories that are attached to sent are stronger!!!! Aromatherapy is also referred to as the fragrant art of using socially selected aromatic oils for therapeutic purposes. It is one of the fastest growing complementary therapies in the world and is recognized as one of the most natural and holistic treatments available today.